Blue Sgrafitto images of Dakota Maidflower turkey images, flax, clover, corn, wheat, cows, sheep, hogs. The crown-jewel of the of the Cable era valued in 1999 at approximately $20,000.00. This single vase is the single most important piece of pottery ever made by Margaret Cable. M Cable 1926 Seal. 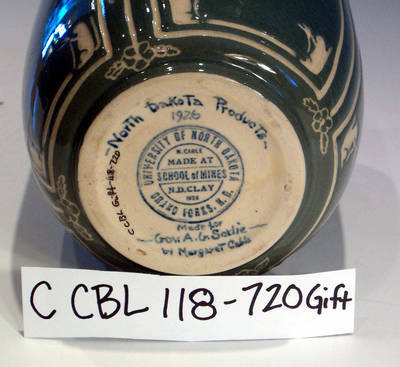 North Dakota (handpainted) Products, 1926 made for Governor A.G. Sorlie by Margret Kelly Cable handpainted. [Known as the Sorlie Vase]. Cable, Margaret Kelly, "C CBL 118-0720 Gift Side B" (1926). UND Pottery Collection. 1765.